Whilst taking in the Derby della Madonnina (Milan Derby), I begun to realise that the Italian league is making a successful comeback after some very dark years indeed. Serie A (Italian top-flight) hit rock bottom back in 2006, when the Calciopoli scandal hit the headlines, implicating many well-known teams in the process, notably Juventus, Fiorentina, A.C. Milan and SS Lazio. Juventus were hit the hardest when the punishments were issued. The club were stripped of two league titles and then subsequently relegated to Serie B (it had initially been Serie C, but changed on appeal) and deducted 9 league points. 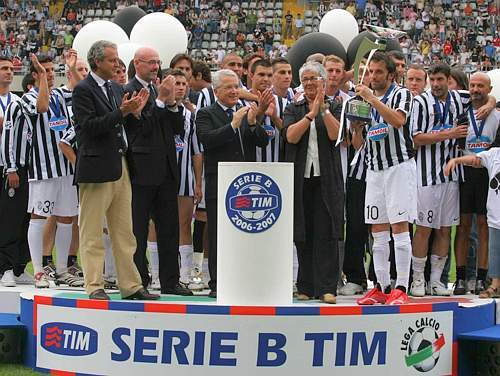 The picture above says it all, showing Juventus after they won Serie B title to return to Italian football’s élite group. A large proportion of sombre and embarrassed faces I think you will agree? Italian football is still struggling to shake of the shackles from another in the long line of alleged corruption scandals they have faced over the years and will probably face in the years to come. So I shall not mention those dark years again, other than to say that Calciopoli roughly translates in English as Bribesville, talk about been straight to the point!! The football is now beginning to do the talking in Italy and I feel that Serie A is getting back towards the levels it reached in the mid 90’s when Channel Four coverage allowed it to rival the EPL (English Premier League). The derby on Sunday evening was a fantastic advertisement, not only for the Italian league, but the beautiful game worldwide. It was an action packed match, full of incidents, controversy, passion, skill and well-known, top-level footballers. Looking to the bigger picture in Serie A, the league has many points to offer, to rival its Spanish and English counterparts. The romance of the lesser teams succeeding, Palermo and Genoa immediately spring to mind. The league, in my opinion has two of the three best goalkeepers in the world; Julio Cesar (Inter) and Gianluigi Buffon (Juventus) with the other been Iker Casillas (Real Madrid). The league is beginning to produce some fantastic young players; Mario Balotelli (Inter), Davide Santon (Inter,pictured below with David Beckham), Luca Antonini (Milan), Claudio Marchisio (Juventus) and Giampaolo Pazzini (Fiorentina), to name but a few. Check them out when you have chance. The league is able to attract big name signings with the likes of Diego (Juventus), David Beckham (Milan) and Wesley Sneijder (Inter) choosing to ply their trade in the Italian league. Many football fans will judge how strong the league is by their successes in the Champions League, sadly many English football fans don’t watch foreign league football and they truly should (that’s a rant for another day). Says a lot in my opinion, the Italian league has had a wobble, but was strong before the Calciopoli scandal and is coming back strong now and will continue to grow in strength. ESPN have provided fantastic coverage this season of Serie A so far this season. They are also provide live coverage of the Coppa Italia (Italian Cup), so take my recommendation and watch a couple of live matches in the near future.